In early 2015, NCSBN convened two panels of experts representing education, research, and practice to discuss the delegation literature and key issues, and evaluate findings from delegation research funded through NCSBN’s Center for Regulatory Excellence Grant Program. The goal was the development of national guidelines to facilitate and standardize the nursing delegation process. These National Guidelines for Nursing Delegation build on previous work by NCSBN and the American Nurses Association, and provide clarification on the responsibilities associated with delegation. Additionally, these guidelines are meant to address delegation with respect to the various levels of nursing licensure (i.e., APRN, RN, and LPN/VN, where the state NPA allows). The delegation process is multifaceted. It begins with decisions made at the administrative level of the organization and extends to the staff responsible for delegating, overseeing the process, and performing the responsibilities. It involves effective communication, empowering staff to make decisions based on their judgment and support from all levels of the health care setting. 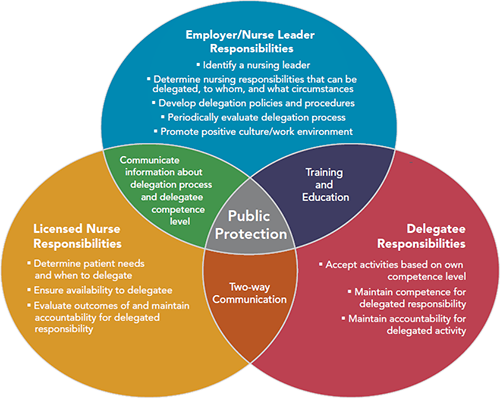 The employer/nurse leader, individual licensed nurse, and delegatee all have specific responsibilities within the delegation process. (See Delegation Model below.) It is crucial to understand that states/jurisdictions have different laws and rules/regulations about delegation, and it is the responsibility of all licensed nurses to know what is permitted in their state NPA, rules/regulations, and policies.